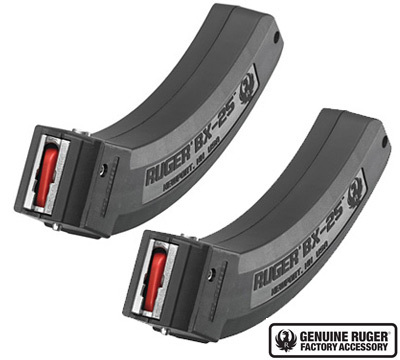 Ruger cannot bill to or ship 25-round magazines to the following states and cities: California, Colorado, Connecticut, Hawaii, Maryland, Massachusetts, New Jersey, New York, Vermont, Washington, DC. ILLINOIS: Aurora, Cicero, Skokie, Chicago, North Chicago, Chicago Heights, Cook County, Buffalo Grove, Dolton, Hazel Crest, Highland Park, Homewood, Melrose Park, Oak Park, and Evanston. DO NOT ORDER THIS PRODUCT if you live in these locations. I bought the Ruger 10/22 rifle which I love. I bought six BX 25 magazines and I hate them. Every single one of them Jam about every five rounds. The stock 10-round magazines that came with the gun never Jam. Do not buy the BX 25 magazines. Im going to do what I can have Ruger reimburse me. As of July 2018, I use these magazines regularly and they work great, definitely better than any of the third party high cap mags. I heard these had a rough start back when they first came out, and so thats likely where all the bad reviews on this are from, but Ruger got it together, every single one of these Ive bought has been good. So dont hesitate to pick up a couple. I dont understand the negative reviews. Ive had my BX 25 from the moment they were introduced years ago. Fits fine, and Never, Not even once experienced a jam using CCI Blazers or Federal bulk. I hand load, and even use a Butler Creek turn style speed loader and zero malfunctions. 1000s of rounds shot. For the negative reviews - my gun itself had a break in period where I stoved pipes with all bulk pack ammo with the exception of CCI Blazers and this was with the factory 10 shot clip. After about 1000 rounds flawless with the 10 shot clip and again, after my purchase of the BX25 which the gun was broke in by this point Never had an issue. Read this review. Telling it like it is! Don’t buy BX-25 magazines.. I read all the negative reviews but figured I would find out for myself. Constant stove pipes with these mags. Shameful that Ruger sells them. I returned them for refund. You can always buy them and return them when they don’t work, because that’s what will happen, but you’re still gonna lose a few bucks for shipping. Save yourself the stress of these not working and just don’t buy them. I don’t know if any of the other after market high capacity mags work, but these definitely dont. Bought two of these. Both have the same problem: poor fit in the magazine well. Worked best with CCI Mini-Mag. Worked not at all with CCI standard velocity until I forcibly held the magazine in place while shooting. Not recommended. I bought one of these hoping to save some time between reloads. I have tried many different brands of ammo in it CCi, Federal, Remington, etc. The BX-25 jams after a few shots regardless of brand. Ruger should stop selling these as they dont measure up to the quality of the 10/22. I read some other reviews stating that these jam up. The strangest thing happened. When my son loaded mine, it jammed frequently. When I loaded it, it didnt jam once shooting a good 500 rounds. It has to be the way he loaded it but I dont know what he did differently. I ordered 2 2-packs of these mags, and 3 of the 4 had problems cycling. After disassembling and adjusting the MIM feed lips, 2 of those 3 now function. 1 is a hit or miss lost cause. Dont waste your money, as these mags are unreliable. I have tried everything, different ammo, cleaning and manual cycling of match grade ammo, but this mag will not feed an entire 25 rounds. It usually does not feed 4-5 without the round getting stuck in the magazine. I have watched many fixes on youtube which may or may not work, but you should not have to modify a new product to get it to work.